"Emerging Infectious Diseases" provides readers with core information about the epidemiology, clinical manifestations, prevention, and treatment of specific EIDs. The study of these emerging infectious diseases includes not only new diseases themselves, but their spread to new geographic areas, microbial resistance, the impact of EID's on global health, issues of surveillance, and how societal and demographic changes contribute to the appearance of EIDs. This comprehensive, fascinating journey through the history of epidemics focuses on the less-told story of how societies have responded to them - and what those responses reveal about their fears, their believes, and their times. When most of us hear the word epidemic or pandemic, we think plague, festering wounds, unmitigated disease followed by death. A bout of SARS virtually shut down travel to Asia while avian flu [bird flu] led farmers to kill thousands of animals, fearing human infection. In 2009, Egypt slaughtered its entire pig population of hundreds of thousand of animals because of the risk of swine flu entering the country and mixing with endemic Bird flu to give a serious illness virus that would spread easily amongst humans. Even at our most level-headed, the thought of an epidemic inspires a shudder of fear: "It could happen to me! I could die unfairly, in a sweep of death carried in the wind!" In "Dread", Philip Alcabes journeys through the history of epidemics, from the ancients to the present, to reveal how, more often than being pervasive threats, epidemics offer an accurate litmus test of our times, and our greatest fears. Inarguably, plagues have swept across continents and decimated populations: Alcabes isn't challenging history. But through his research he carefully and deftly reveals how epidemics have been responsible for misplaced fears, and in recent years, imagined ones. With the black death of the 14th century that decimated European populations came new fears of strangers, poisoning and evil. In the Rhineland and parts of modern France and Switzerland, Christians hunted and burned Jews to death because they believed them responsible for spreading infestation. By the 18th century, it was thought that miasma, or bad air was responsible for the spread of deadly disease. By the 19th century, germ theory had arrived, and at last people could see the threats of diseases like cholera and tuberculosis. And with the practical identification of germs came a new host of enemies, from the Typhoid Marys of the early day, to more modern fears of bioterrorist outbreaks led by Muslim terrorist cells. An Email notification when this Veterinary Epidemiology page Updated? 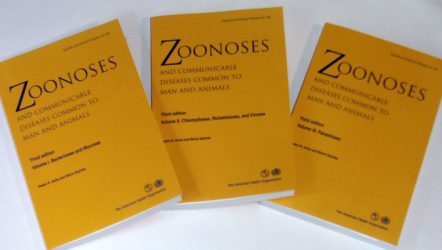 Zoonoses are defined by the WHO as "a disease or infection that can be naturally transmitted between vertebrate animals and man, with or without intermediate arthropod vectors". Worldwide, zoonotic diseases have a negative impact on commerce, travel and economies. This workshop summary covers a range of zoonosis topics including an evaluation of the relative importance of zoonotic diseases against the overall backdrop of emerging infections; research findings related to the current state of our understanding of zoonotic diseases; surveillance and response strategies to detect, prevent and mitigate the impact of zoonotic diseases on human health. by Professor Peter Haggett, University of Bristol, U.K. The Geographical Structure of Epidemics is an accessible and in-depth examination of the ways in which geographical and environmental concepts can enhance our knowledge of the ways in which epidemics spread through human populations, written by a leading expert with over 30 years' experience in the field. 32 diseases, including HIV & Aids, E. coli, West Nile fever (introduced to to North America in 1999), Legionnaires' disease, syphilis, and tuberculosis are covered alphabetically. A fact-filled compendium which includes an introductory section on the impact and mechanisms of spread of infectious diseases in the world. A glossary of terms is included. Coloured maps give a clear and instant overview of where and when each disease developed. There is also information on current global distribution, causative agent, mode of spread, clinical symptoms, treatment, prevention and control. A historical chronology goes back 10,000 years. Bovine spongiform encephalopathy (BSE) or "mad cow disease," first diagnosed in late 1986, is transmitted through feed, indirect horizontal transmission, apparently maternally and possibly horizontally, through cattle-to-cattle contact or a contaminated environment. With no ante-mortem test yet developed, the only information available about BSE is from case surveillance and a limited number of experiments. Only through careful and rigorous modeling and analysis can reliable estimates of past infection and predictions of future cases be made. The modeling developed for BSE utilizes a range of techniques from statistics, ecology, and demography that is of interest both as a case study and for providing tools for other modelling projects. Statistical Aspects of BSE and vCJD: Models for Epidemics presents the general methodology required for thorough analysis and modeling of novel long incubation diseases with largely unknown etiology.